I planned on going to the Art Club of McKinney Members Art Show at The Cove in the evening, I called Helene and asked if she wanted to join me and maybe get some dinner afterwards. It was a great show. I’m honored to know so many talented friends. There was such a wide variety of amazing paintings, sculptures and photographs. After mingling and admiring the art, Helene and I had dinner at The Pantry. Oh my…chicken fried chicken, mashed potatoes with country gravy and fried okra. No photo, I forgot and you’d be too jealous anyway. The rain clouds were gone and off in the distance, so we walked around the square, sat on a bench a while to people watch and listen to live music from Landon’s Winery. It was a nice evening. When I got home, the sky looked part scary, part glorious. Depends on your personal perception. I see glorious. This morning was our first Art Club of McKinney monthly meeting after our summer break. We are very proud to be the oldest continuing art club in the state of Texas. Way back, in the day, members had to be invited artists, and their possible membership was voted on by the members. Today, anyone and everyone is welcome to join or just visit the group. All are welcome. 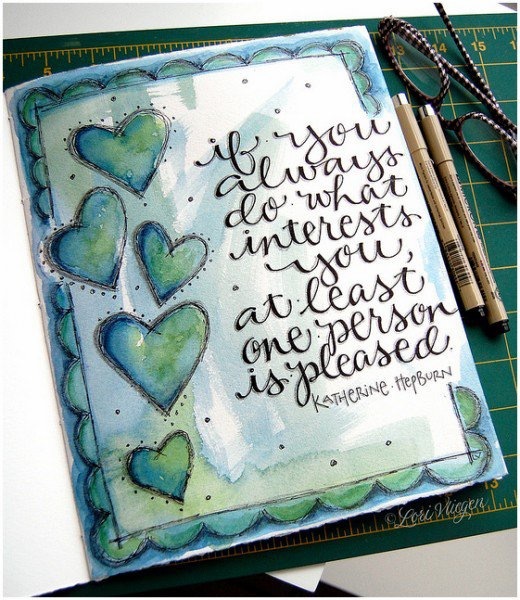 You don’t have to be an artist, or even a student of art. You just need to enjoy friendship, camaraderie, and learning and sharing wonderful art. The first meeting of the season is my favorite. I like to call it “show and tell.” Members are asked to bring a few examples of their art and talk a little bit about their work. I’m sure you can see that we have quite a talented community of artists. Come join us sometime and share in the fun. Today, we had our end of the year luncheon of The Art Club of McKinney. It was held at the beautiful historic Heard Craig House in downtown McKinney. The food was catered by Patina Green on the Square, and was not only delicious, but beautifully garnished. Gina and other members added just the perfect touches and decorations to enhance the yummy food. Before the yummy meal, out-going President, Gina Roberson (L) handed over the hand carved gavel to in-coming President, Sandy Forbes(R). Gifts were given to board members and officers in appreciation for all the hard work and effort throughout the year. Afterwards, a few of us strolled down to the Square on this lovely warm day and stopped at Snug on the Square for an iced tea and conversation. When six artist friends get together to chat, the laughter and creative ideas are endless. Not to mention the sharing of grand-baby pictures. It was a really wonderful day with friends in downtown McKinney. This morning was the November meeting of the Art Club of McKinney. 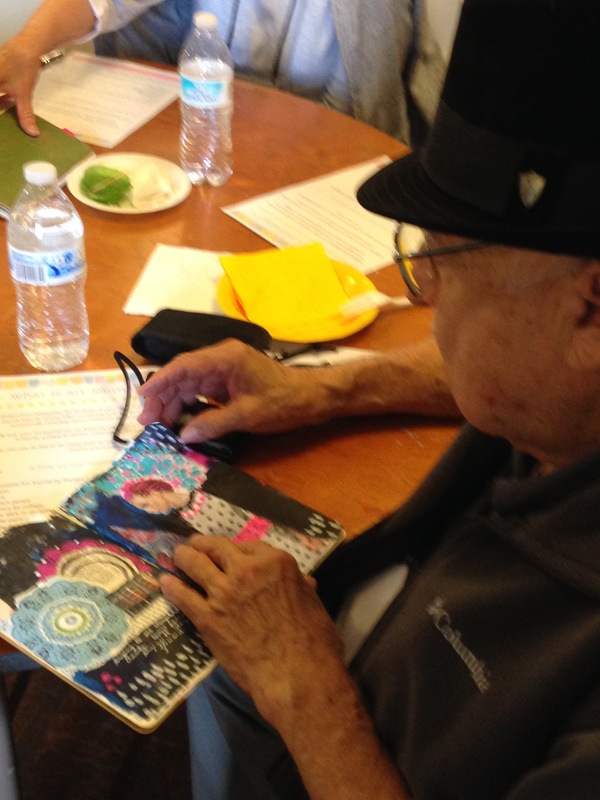 Our guest speaker and artist was Murry Whiteman. Murry is a very talented local artist with never ending credentials and awards. Murry Whiteman is an award-winning graphic designer and artist. He has worked on more than one hundred album covers for such diverse artists as Kool & the Gang to Cusco. He was nominated for Grammy awards in design twice. He has done design and advertizing for movies and TV shows including Star Wars, Indiana Jones, The Facts of Life, Dallas, Walker: Texas Ranger, Hunter and many more. He and his wife and their children have been active in Christian outreach for years, helping to start four churches and a number of missionary journeys over the years. He and his wife Besty live in Texas. Our general meeting always consists of a fine buffet breakfast provided by volunteers, a raffle for door prizes and artist member are encouraged to bring a piece of anonymous artwork to be voted on for artist of the month. 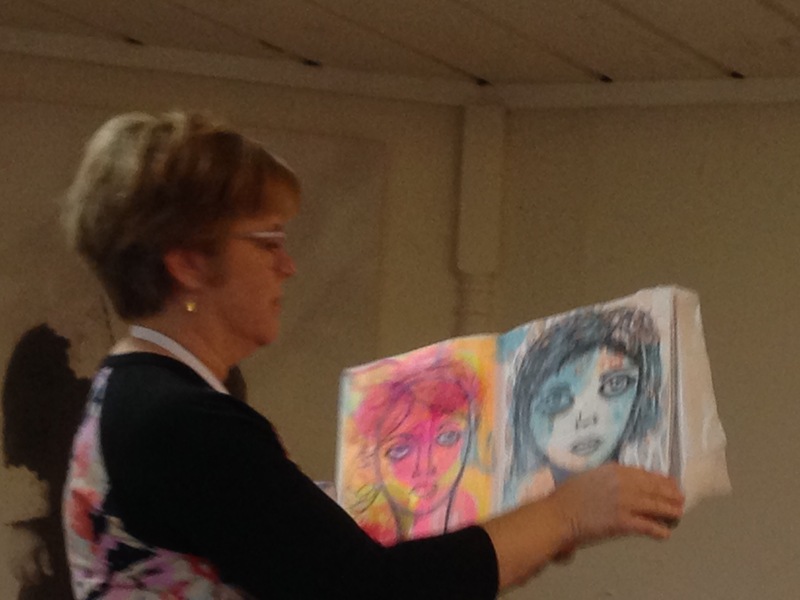 After the general meeting, a guest artist presents a demonstration. Today, Murry shared his tips and tricks on drawing the human figure. We were all given worksheets and information, trying out different shading and proportion techniques with pencil. Mr. Whiteman was charming, entertaining, and very informative. He also offers small group classes at the Martin Place in McKinney. Another great meeting of the Art Club of McKinney. 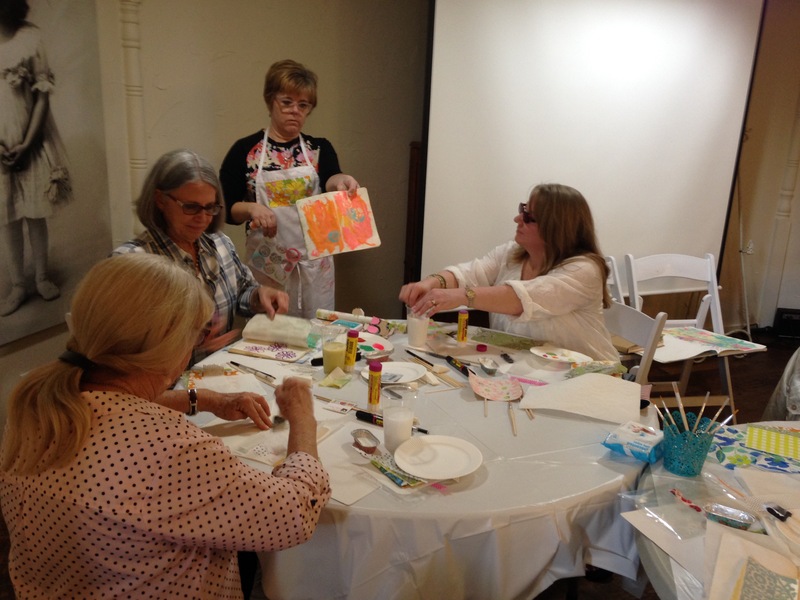 The second Thursday of the month, The Art Club of McKinney meets in the historic Heard Craig Carriage House. The average attendance ranges from about thirty to fifty, but within that small group and those four walls, the amount of creative talent seated in those chairs is phenomenal. After a brief general meeting at 9:30, a beautiful spread of food and drinks was set up by the monthly hostesses. Then, members vote for artist of the month from art work brought in to display. A short break, then on to the speaker. 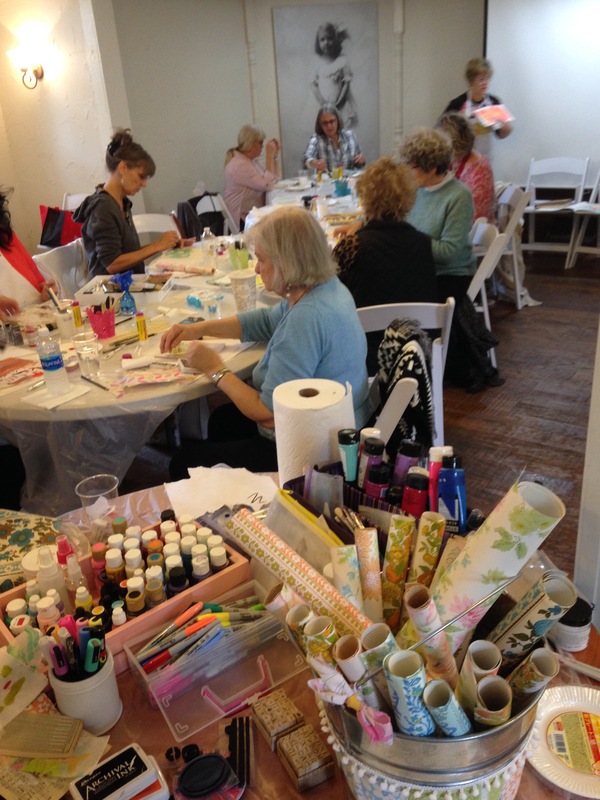 The March guest artist and demonstrator was Cindy Gilstrap. Like most artists, the timid yet amusing art journalist, was a little nervous speaking to the group. 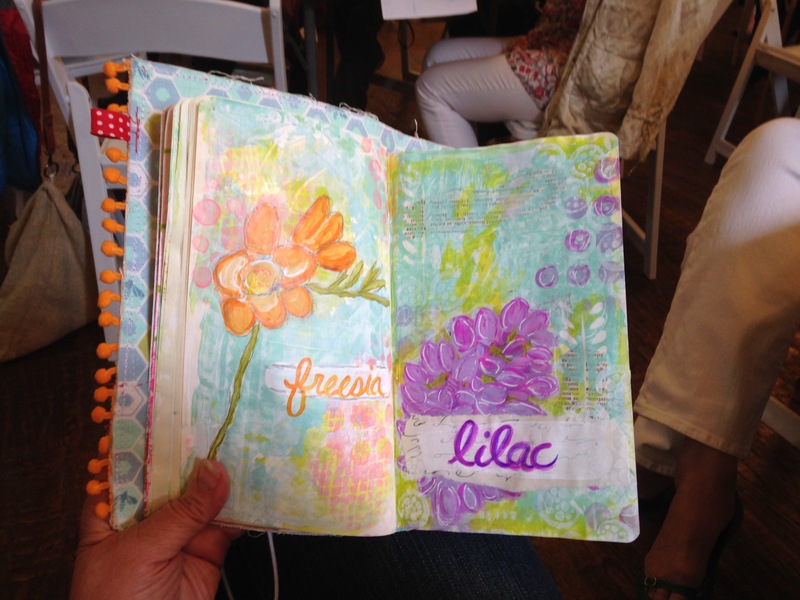 But, once she started sharing her ideas, tips, and passing around dozens of amazing journals, everyone was mesmerized. I think Mr. Angel is getting some inspiration. Talk about talent. See this photo? I was holding the journal in my left hand, holding my phone with my right hand, and I snapped the picture with my nose. Now, that’s talent! After the regular meeting, there was a break for lunch, (like we didn’t eat enough wonderful food in the morning) and a dozen members signed up to return for a hands-on workshop with Cindy. I sure hope some of the gals post and share their works of art on Facebook later. 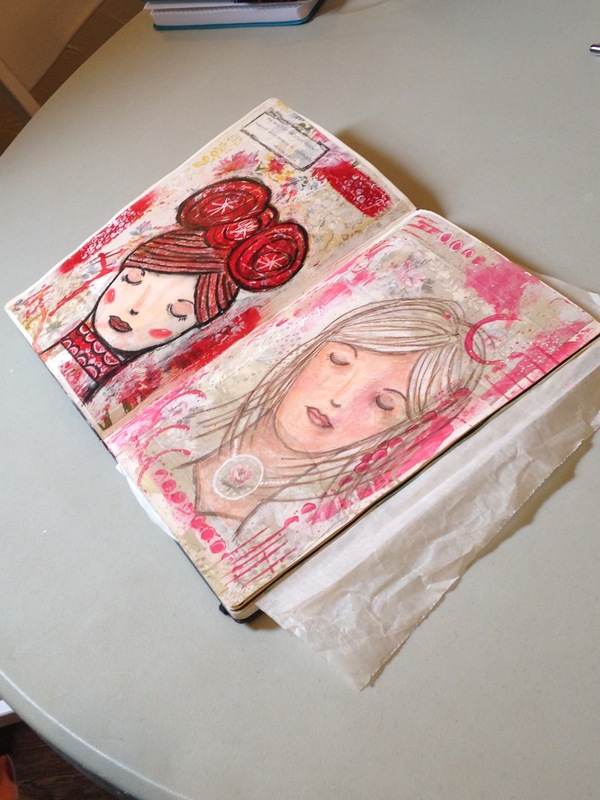 I journal and write every day, but I don’t illustrate or have an art journal. Oh no! Another project to add to my long list of …maybe tomorrow.